Piab's innovative flow control adds a gentle touch to the conveying of fragile food items. Taby, Sweden – With no sharp edges, guided entry and controlled low speed, Piab's piFLOW®t conveyor is designed to handle fragile food as gently as possible. Featuring innovative and ground-breaking new technology, it offers dedicated and gentle handling of delicate ingredients and products, such as coated sweets, candy, roasted coffee beans, whole nuts, and nutraceutical tablets. At the heart of piFLOW®t sits the proprietary piGENTLE®, an innovative technology (patent pending) that maintains a gentle flow by regulating the feed pressure of the pump, ensuring that fragile food items are also handled gently. Combined with unique guided entry into the conveyor and the elimination of sharp edges, the piGENTLE® technology enables piFLOW®t to successfully solve issues encountered when vacuum technology is used for conveying delicate items. ”piFLOW®t has been carefully designed to offer dedicated conveying of fragile ingredients and products. Such items are handled daily in the food industry, and we have applied all our technological know-how to come up with a solution that ticks all the right boxes,” comments Jarno Tahvanainen, Vice President of Piab's Material Handling division. Suitable for transporting up to four million items per hour, the piFLOW®t conveyor can be used to transport any fragile goods within a processing plant. 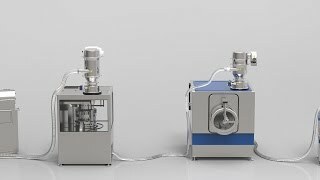 Eliminating the use of inadequate standard equipment and alternative, often back-breaking, manual procedures, piFLOW®t will safely transfer ingredients and products between the various processing units, such as tablet presses, coating drums, and packaging lines, avoiding all risks of damage. piFLOW®t is an extension to Piab's popular and high-quality range of piFLOW® conveyors for powder and bulk materials, and is specially developed to meet the stringent demands regarding operational safety and hygiene within the food (piFLOW®f), pharmaceutical (piFLOW®p), and chemical (piFLOW®i) industries. Piab provides smart solutions for the automated world, helping thousands of end users and machine producers in e-commerce logistics, food, pharma, automotive and other manufacturing industries to improve energy-efficiency, productivity and working environments. With 430 employees and SEK 1 bn in sales 2017, Piab is a global organization, serving customers in almost 70 countries from a network of subsidiaries and distributors. By leveraging the ongoing technological development in automation and robotics, and targeting high-growth segments and geographies, Piab's vision is to become the global leader in gripping and moving solutions.